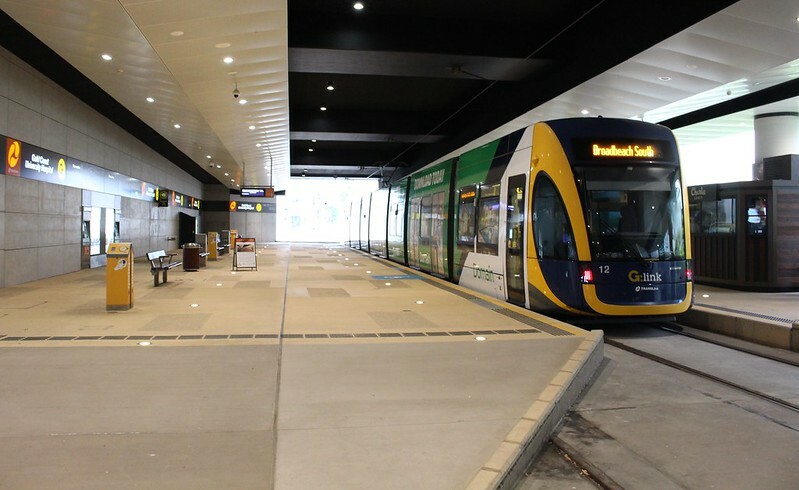 The Gold Coast Light Rail, also known as G:Link opened in July 2014, making it Australia’s newest completed tram/light-rail line. I was very impressed when I rode it last week. As you would hope and expect, they’ve put a lot of thought into the design, and there are a number of things Melbourne can learn from it. 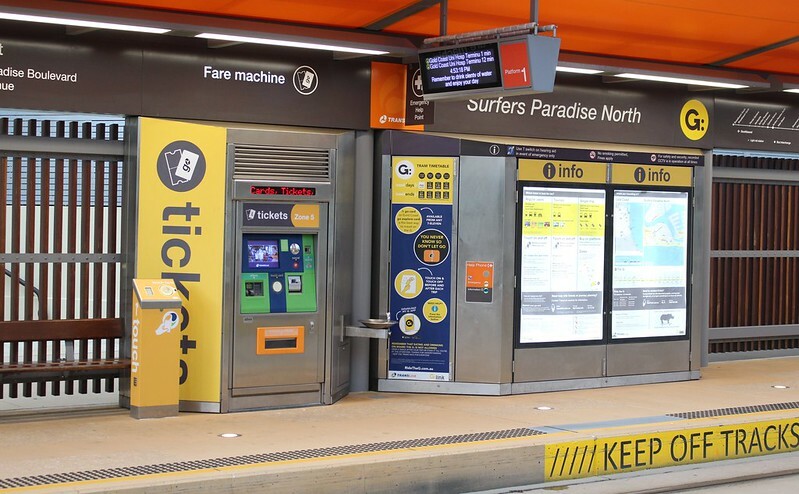 The line is 13 kilometres, from Broadbeach South, parallel to the beach, through the very busy, dense centre of Surfers Paradise, up to the Gold Coast University Hospital at the northern end. 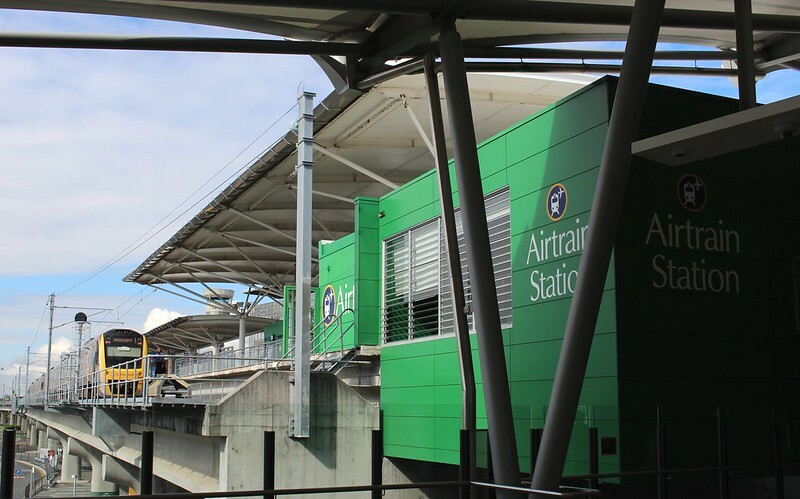 While not ideal — it doesn’t serve the airport or connect to the rail line to Brisbane — they obviously built it with later extensions in mind, as both termini have additional currently unused track which is intended to be used should the line be extended. There was opposition while the line was being built, but it now seems to have been deemed a success, with the project helping to spark billions of dollars of investment along its route. 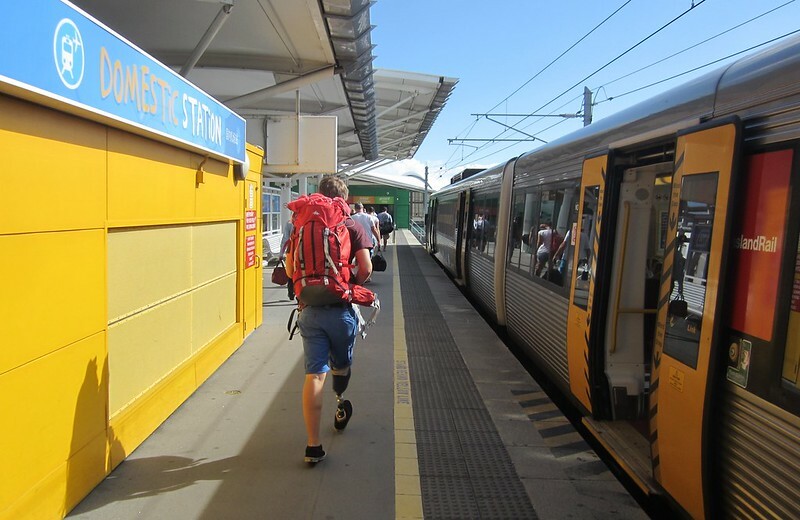 An extension to Helensvale Railway Station got underway in 2016, expected to open before the Gold Coast hosts the Commonwealth Games in 2018. Behind hoarding at the northern terminus you can see work is already underway. From what I saw, along almost all of the route the trams travel in their own dedicated lanes. This has resulted in closure of vehicle traffic lanes, and in some sections of Surfers Paradise Boulevard, means car traffic can only travel southbound. The nearby Gold Coast Highway caters for through-traffic. This has turned Surfers Paradise Boulevard from something of a traffic sewer (as I recall it in 2011) into almost a transit mall, with a small amount of parking for southbound cars, but mostly they move slowly through seeking to access side streets and off-street parking. I did see what I’m guessing was an Uber X car, doing a couple of laps trying to find their booked fare. At one point he stopped and a couple climbed in, only to get out again when it became apparent it was the wrong Uber. 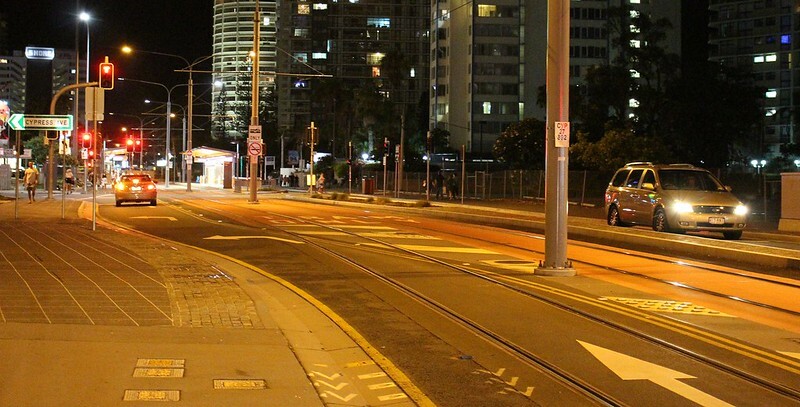 There is a small section of shared roadway where cars and trams mix, northbound only between Thomas Drive and Cypress Avenue towards the northern end of Surfers Paradise — it appears this is to provide vehicle access to a few side streets. What’s really eye-opening to a Melburnian is the traffic light priority for trams. T lights are used extensively along the route. But unlike Melbourne, they don’t go green for trams unless trams are approaching. 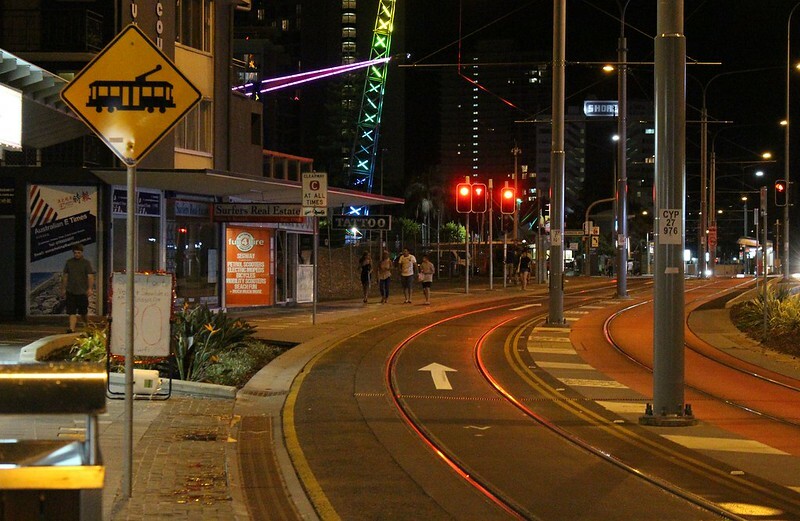 And when they do, they anticipate the tram’s arrival, triggering the T light to prevent the tram having to wait. Yes, real traffic light priority. Not just reducing delays, but keeping the trams moving. Melbourne has almost nothing like this. The closest we have is the two former rail lines, 96 and 109, where trams approaching former rail level crossings get priority, sometimes even with boom gates. And there should be no reason that approaching trams in mixed traffic can’t also be detected so they can get a green. 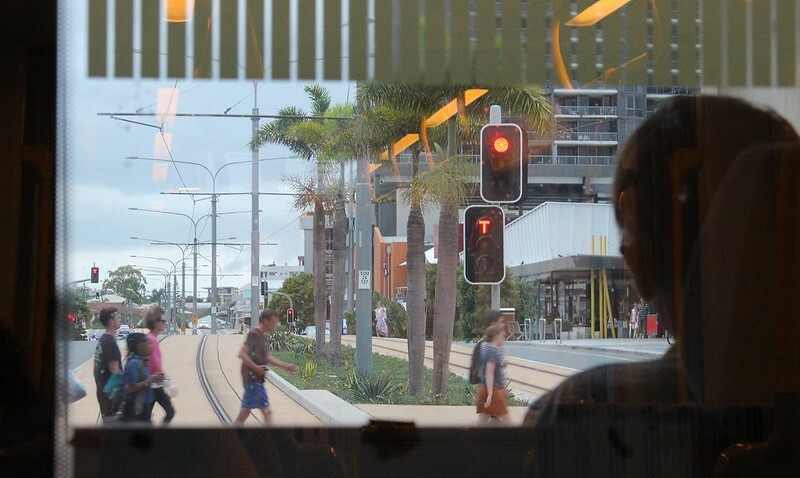 Gold Coast tram priority isn’t perfect. 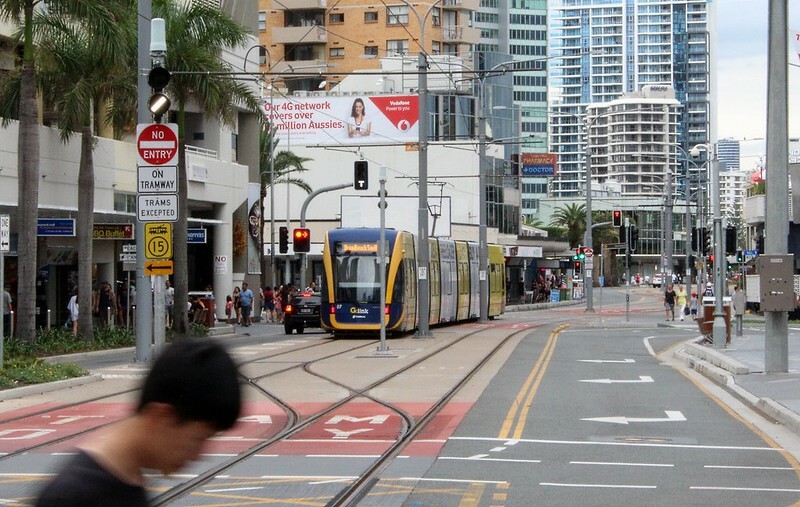 In the very densest part of Surfers Paradise I saw trams waiting at red lights. It wasn’t actually obvious why this was the case, as it appeared a tram green could have been inserted into the sequence without unduly disrupting other motor and pedestrian traffic. The other issue is that sometimes the tram didn’t get the green soon enough, and had to slow down slightly. This is a noticeable issue on Melbourne’s 96 and 109 routes as well. Perhaps it’s to enforce a slower speed limit at possible conflict points with cars. Stop distances are far wider than most in Melbourne. By my calculations there’s an average of about 850 metres per stop, though some in the dense area of Surfers Paradise are a bit more closely spaced. 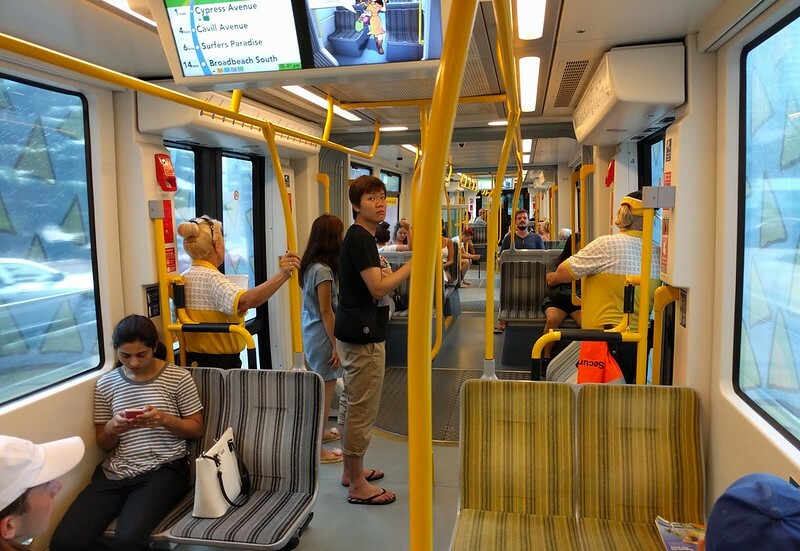 All stops have platforms, and all trams are low-floor, meaning the entire route is accessible for mobility aids and prams — as you would hope for such a recently built system. Possibly unique, inside the trams there are dedicated spots for surf boards, though I didn’t see any in use. There is extensive use of ads covering the windows. Visibility from inside looking out seemed mostly okay on a clear day. But it may be quite a different story at night, especially when raining. Announcements and screens indicating the next stop helps obviously, but it was difficult to see inside as the tram arrived to tell which section was least crowded. Card readers are at stops, not on the trams. Of course this is possible where there is only a small number of stops — it would be difficult on a huge system of hundreds (thousands?) of stops, as in Melbourne. Each platform has a ticket machine and information. I saw no platform staff (sometimes seen at busy Melbourne CBD stops) though it appeared common for the stops to have small retail (eg coffee shops) built-in. The tickets are part of the Go Card system, offering smartcards or short term (single trip) tickets. Other than drivers, there are few staff on the system. I did see what appeared to be the equivalent of Melbourne’s Authorised Officers, groups of two or more uniformed staff roaming around, it appeared with ticket checking equipment, but I didn’t see them checking tickets. 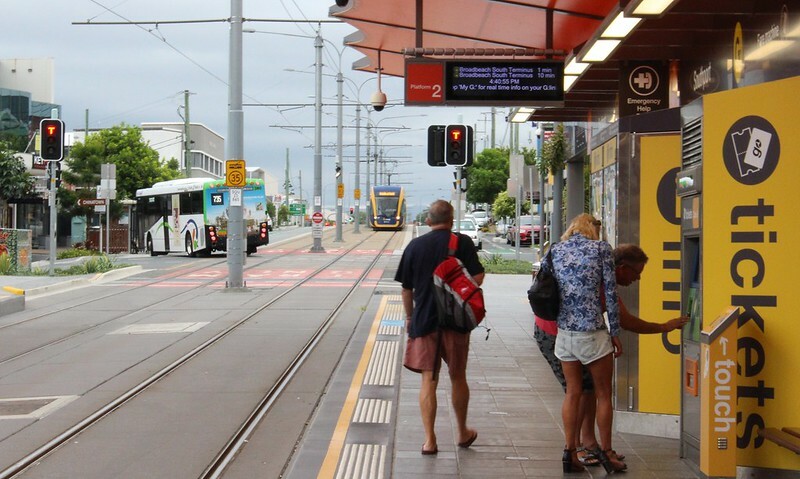 Some trams included advertising nagging people to pay their fare – as with Melbourne, the system is open, but they sometimes have ticket checking blitzes. 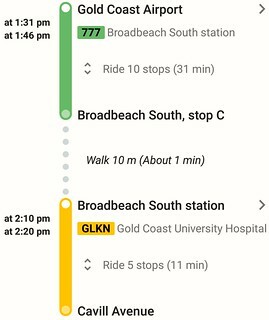 When you ask Google Maps to plot you a trip from Gold Coast Airport to Surfers Paradise, it tells you to hop aboard the 777 bus (which runs every 15 minutes, 7 days-a-week, which I think might make it a better level of service than just about any single Melbourne bus route, though some combined services would surpass it). 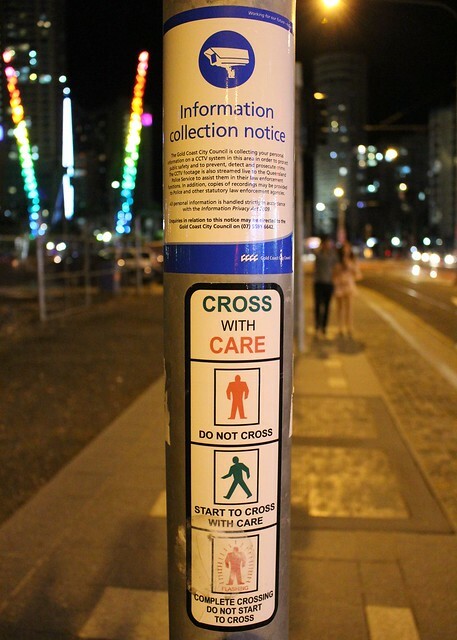 Then it tells you to alight the bus and walk ten metres and board a tram the rest of the way. Frankly I didn’t believe it. Ten metres? They’re making it up. But when you step off the bus, you see it’s true. 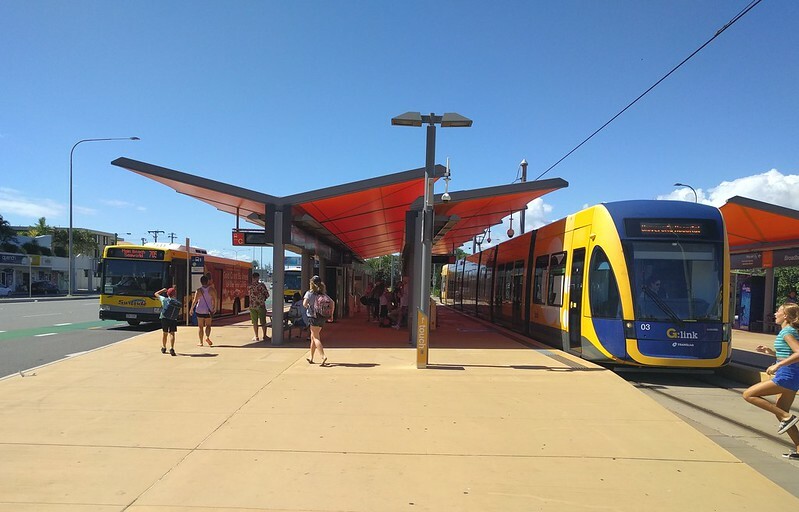 The Broadbeach South interchange is really nicely setup – buses arrive either side of the tram, which is on its terminating track in the middle of platforms on either side. 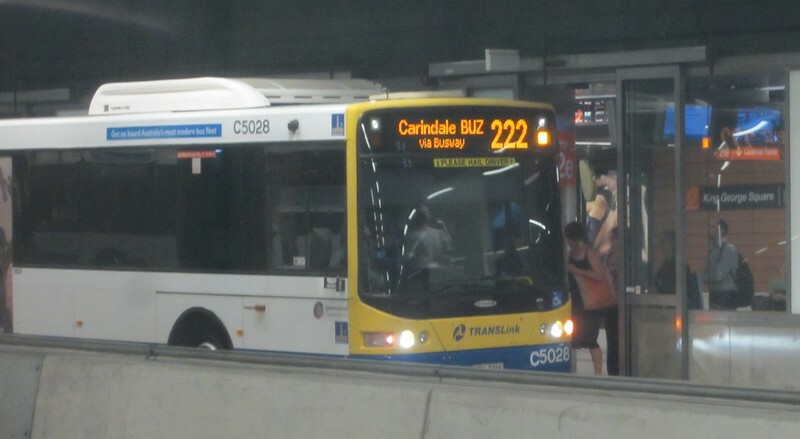 When the light rail line opened, local bus routes got a shake-up. This makes sense – with a new 13 km trunk route, it’s logical to change bus routes around to feed into it rather than parallel it, though a few routes still make the north-south route parallel to the trams. 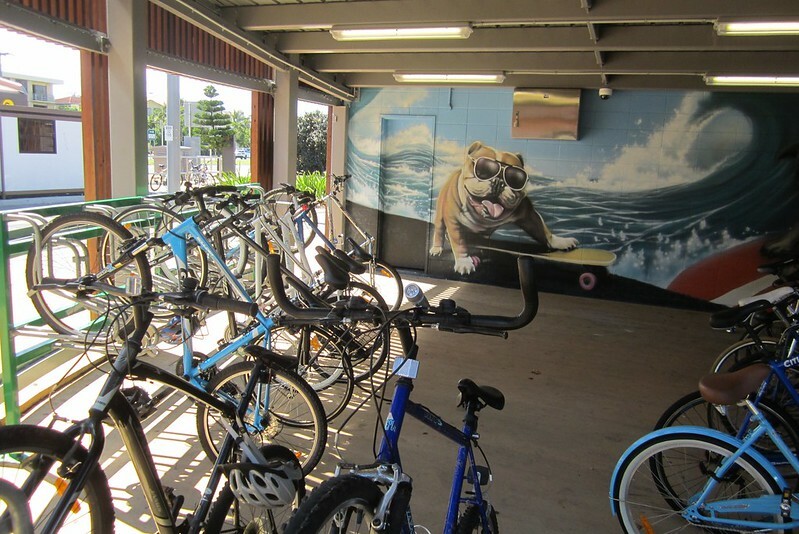 The interchange includes bicycle parking, and there are shops nearby, though no retail directly integrated into the stop. And how often to the trams run? Well the “timetable” (which is actually a frequency guide) sums it up: every 7.5 minutes on weekdays, 10 on weekends, 15 evenings and early mornings, and 30 overnight on weekends. 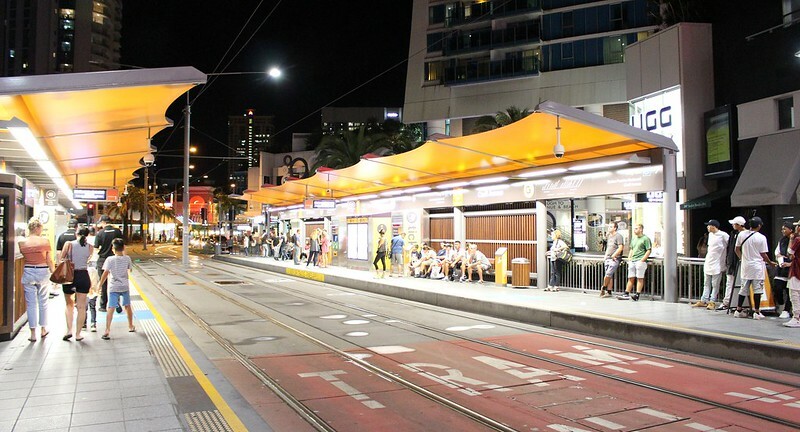 On weekdays overnight, the 24/7 700 bus, which normally connects with the tram at Broadbeach South, is extended to parallel the tram route, running every half-hour on weekdays overnight. 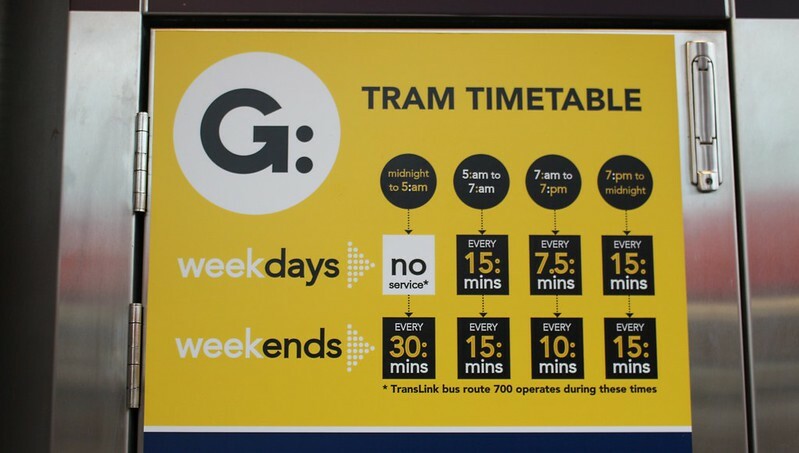 This means this line runs a better off-peak, evening and overnight service than almost any Melbourne tram route, though we have more frequent peak services on some routes. 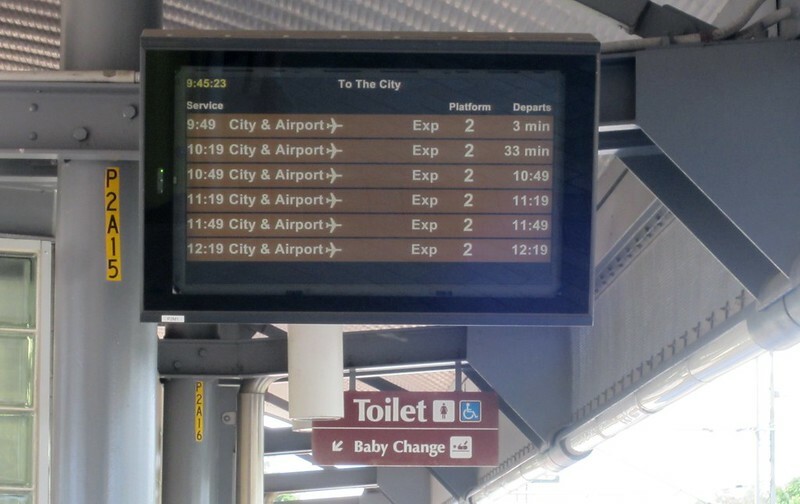 Specific times aren’t published at stops, nor on paper timetables — the stops have realtime departure countdowns, and the paper timetables only have the frequencies. 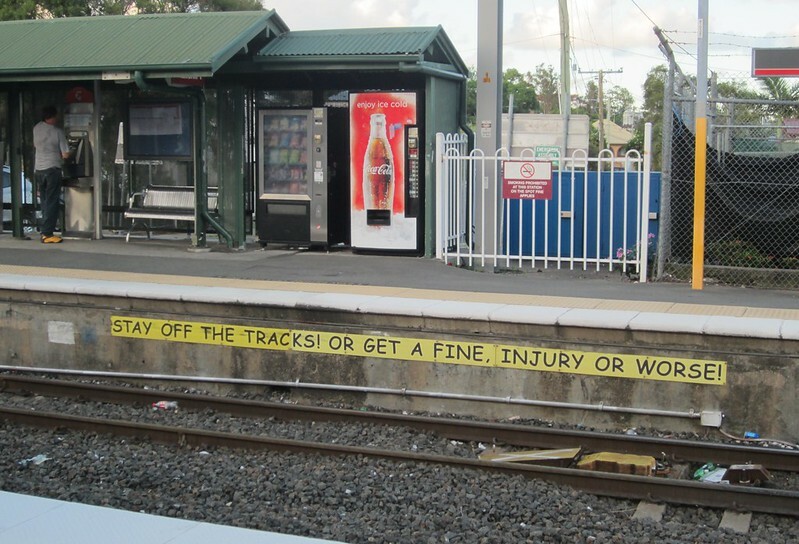 This is probably almost okay when the trams are every 10 minutes or better… less so when only every 15 or 30 minutes. The Translink web site (and it appears Google Maps/Transit) includes specific times. The trams in Melbourne and on the Gold Coast are operated by the same company, Keolis DownerEDI Rail (KDR). 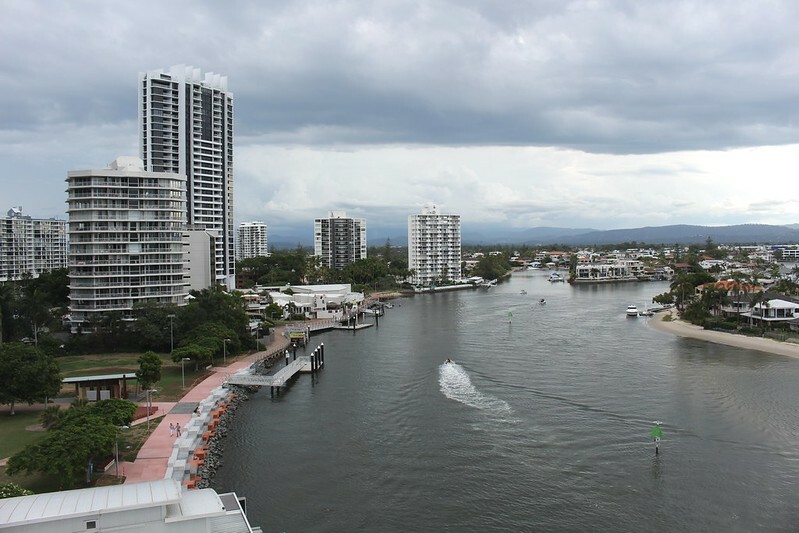 Gold Coast’s single line opened only in 2014, and is built to modern standards. Melbourne’s tram system is vast, and aging. We can’t expect our network to be brought up to these standards overnight. But we can learn a lot from the Gold Coast. More frequent services at all times would cut waiting times and make trams more attactive to passengers. 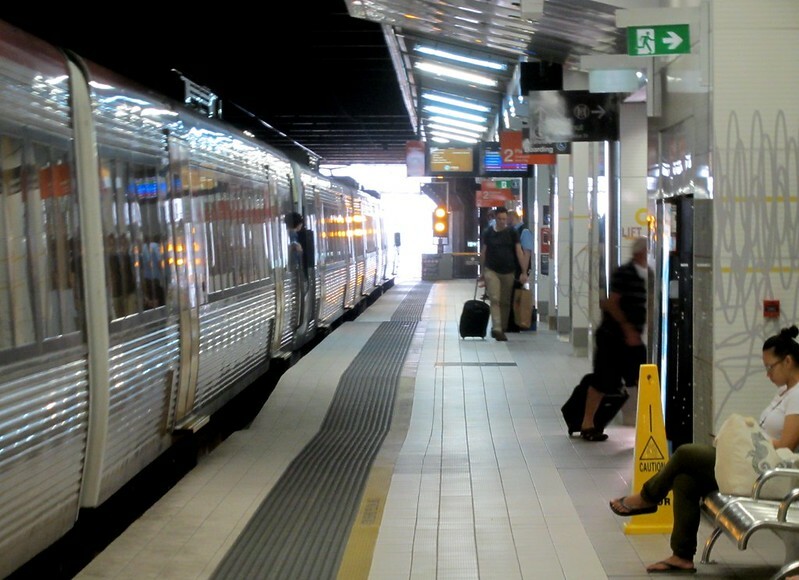 The opening of the line helped boost Gold Coast public transport overall by some 22% in the first ten months. Improving Melbourne’s tram connections (such as ensuring trams don’t terminate just short of railway stations) would help the whole public transport network to grow. 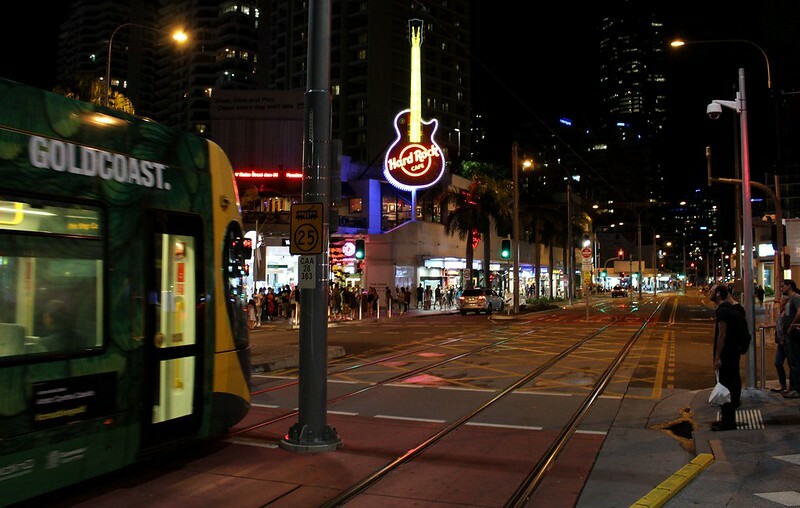 Tram priority is something holding Melbourne’s trams back — and is an important part of the Gold Coast system. Putting in some proper traffic light priority to prevent trams having to wait at traffic lights would be almost imperceptable to Melbourne’s inner-city motorists, but help ensure tram travel is more time-competitive and that our huge investment in tram infrastructure is more efficiently used. Early start. If all went to plan, I was going to be at Melbourne Airport to meet my offspring at 12:30, assuming they made their connection in Sydney at 11:15. Being there at 12:30 meant flying out of Brisbane by 9am, as the flight is a little over two hours, and in summer there’s an hour’s time difference due to daylight saving. To be on a 9am flight (8:55 to be precise) means being at the airport 45 minutes earlier, 8:10, which means being on an airport train by around 7:45… which would mean leaving the hotel at 7:40. How long would the queue be at check-out? As it happens, I woke pretty early again, had a cup of tea, packed up my stuff and checked-out (very quick), before heading to the station. 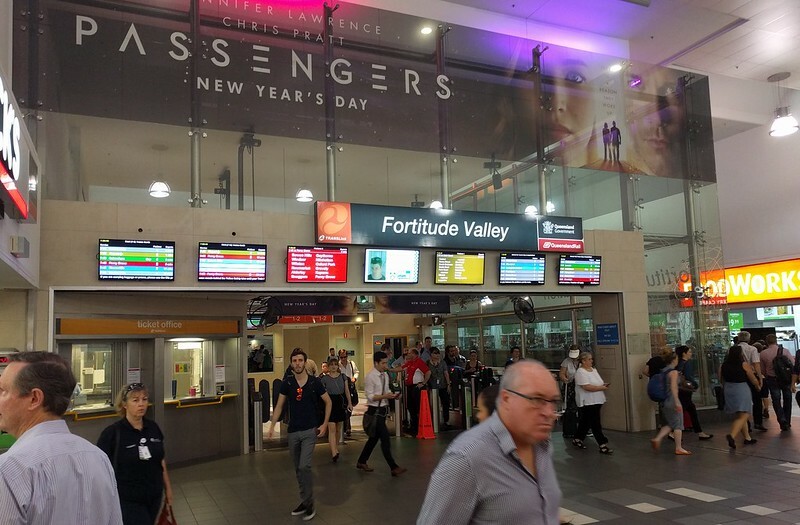 It was peak hour, and commuters streamed out of the gates at Fortitude Valley – a contrast to the dodgy types hanging around outside the station the night before. Despite the train having to wait for another coming back the other way (the perils of single track) I was at the airport on time. Track congestion might be an issue, but it’s a lot less worse than the traffic congestion suffered by Skybus. I was about to skol my bottle of water when a passing security bloke said it would be allowed through security — they’re only banned from international flights. In the rush I hadn’t eaten breakfast (well, apart from a meusli bar) having found the gate I bought a ham and cheese toastie and ate it while I waited. I’m surprised at how many of you have been asking if this grand rendezvous plan actually came off, and whether I was able to meet my sons on their trip Las Vegas via Los Angeles and Sydney (the final leg also being on Qantas domestic). 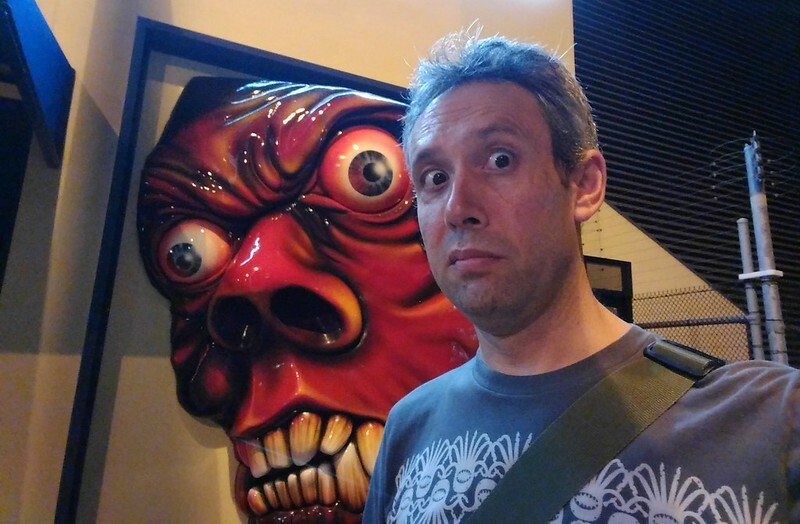 As if this far-too-detailed trip blog (which frankly is more for my benefit than yours!) needs a plot point for some suspense? 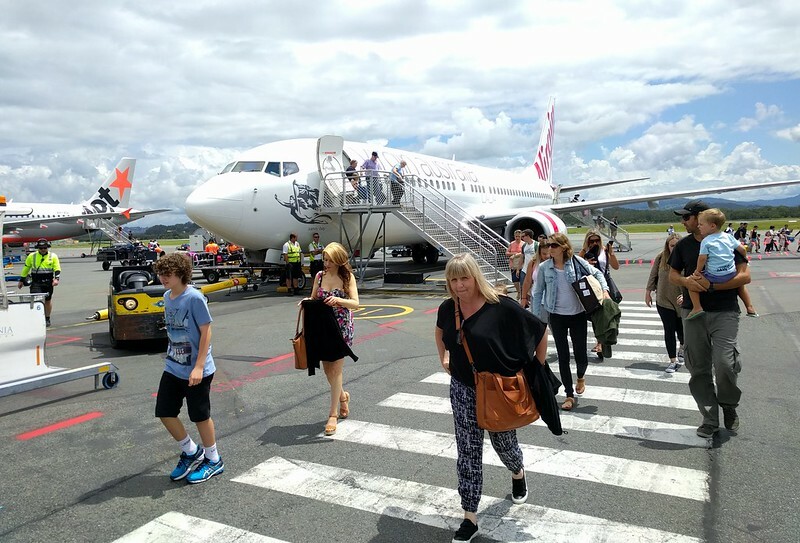 Though I’d flown up on Virgin, but I was flying back on Qantas — part of the plan. And I didn’t check in any bags, but took my two small backpacks through security with me onto the plane. That way I could meet my sons in the terminal. Unfortunately the plane was a bit late pushing back. 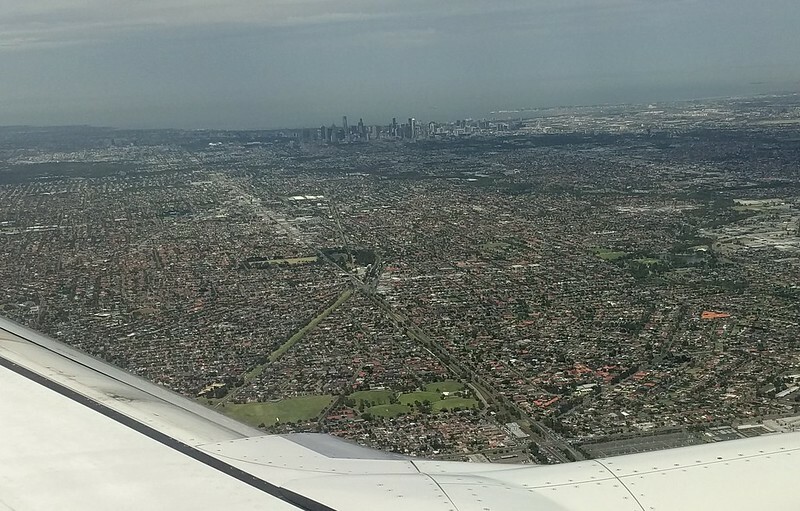 But we made up time, and after a route that gave us a nice view out of the window of Melbourne’s CBD, we landed only a few minutes late. My flight had been scheduled to arrive twenty minutes before theirs, so I made my way to their gate and waited. The sign said they’d just landed, and before too long the plane arrived. But had they made their connection? Were they actually on it? People started to come out of the gate in ones and twos. Then there’d be a bigger group of people, then none for a while, then more. I saw a familiar face: a bloke who lives down the street from me came out. Small world; he’d been on that flight. More and more people came out. Then none for a while. The staff by the gate went in and went down the ramp. Was that all the people? They’d been away for four weeks, and it was good to see them back. They’d had a good time. We came out of the secure area of the Qantas terminal to find TV news crews… though not for us of course. I asked one of the camermen I knew what the story was; he said they were there to film/interview arriving Renegades cricket players, following an incident the night before when a player got hit in the face with a cricket bat. Ouch. Outside the terminal it was hot – far hotter than I’d experienced in Queensland. We walked back to the car and drove back home. Stay tuned for some eye-popping detail about the new(ish) Gold Coast Light Rail line coming soon. Queensland can teach Victoria a thing or two. Day two of my quick trip to Brisbane. Memo to myself: when in Queensland in summer, make sure the blinds/curtains are closed properly before going to bed. Given no daylight savings in the Sunshine State, you can expect the sunshine to come through the window at about 5am. I found myself awake at about 5:20, and it wasn’t particularly easy to get back to sleep. When I eventually got up, it was time to head north to Brisbane. After the buffet breakfast ($12.50 if pre-booked, that’s reasonable — unlike some hotels that will sting you $20), I checked-out of the hotel. Google Maps gave which gave me two choices: the first was to walk a couple of blocks, wait a while, catch a bus to Nerang station, then train to Brisbane. Or I could catch the tram a few stops, catch a different bus to Nerang station, then the same train. I took this option. It’s slightly slower but (thanks to the buses and trains only running half-hourly — but timed to meet) avoided waiting around for the bus — and I could see/cover more ground as I travelled. 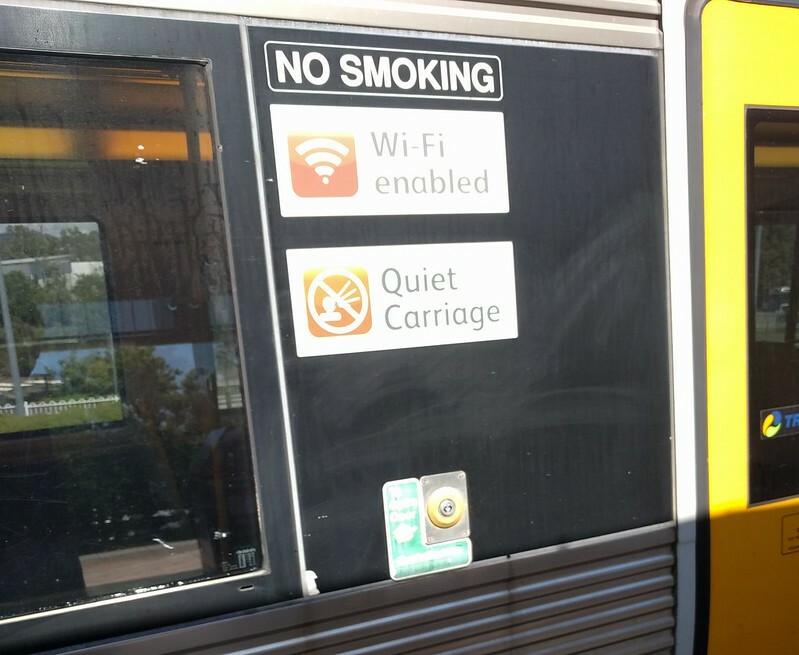 That all went smoothly and as the train pulled in, the signage on the carriages remembered me two things about Queensland Rail’s services: free WiFi (on some trains?) and Quiet Carriages. I found a good spot in a Quiet carriage. This was going to be a good trip. I fired up the laptop, connected to the WiFi and got to work catching up on emails, while glancing at the scenery. After a few stops a lady and her chatty granddaughter sat right behind me — the granddaughter wanted to go to the next carriage, but the lady insisted sitting in this one, despite the presence of an errant Coke bottle, which she moved to another seat in the next carriage. At some point I decided I wanted to shoot some video of the passing scenery, and that it would be better without the girl’s commentary track, so I moved into the next carriage, which was quieter even though it wasn’t a Quiet Carriage. We rolled into Brisbane and I hopped off at Fortitude Valley station and made my way up Brunswick Street. 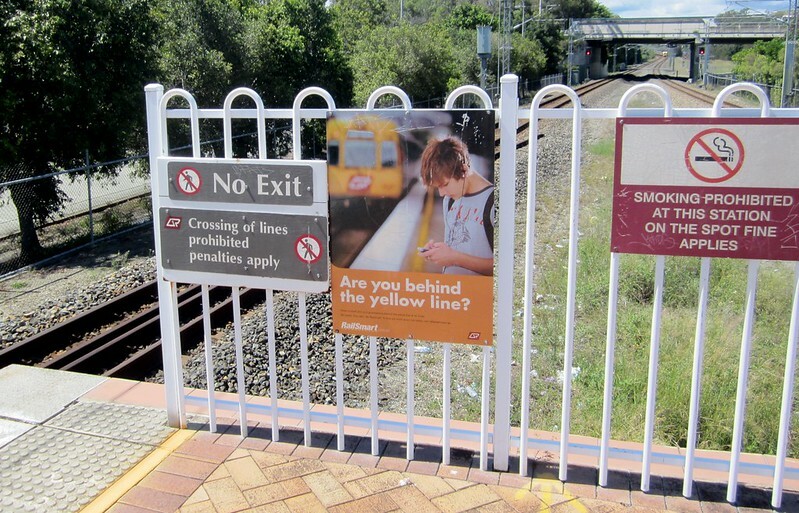 Fortitude Valley station. note the gap at most doorways, and the hump to assist with wheelchairs. 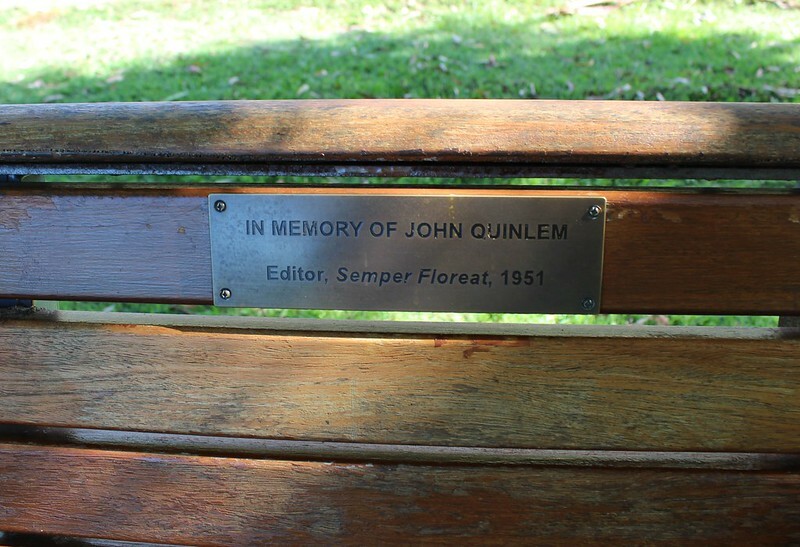 We had a bite to eat then caught a bus along the busway to University of Queensland, then walked around the lake to find my Dad’s memorial bench. It seemed more shady than when I was last there; perhaps they’ve planted an extra tree or two. I’d gone prepared to wash bird poo away, but it was spotless, if perhaps in need of a little varnish (on the wood) and Brasso (on the plaque). 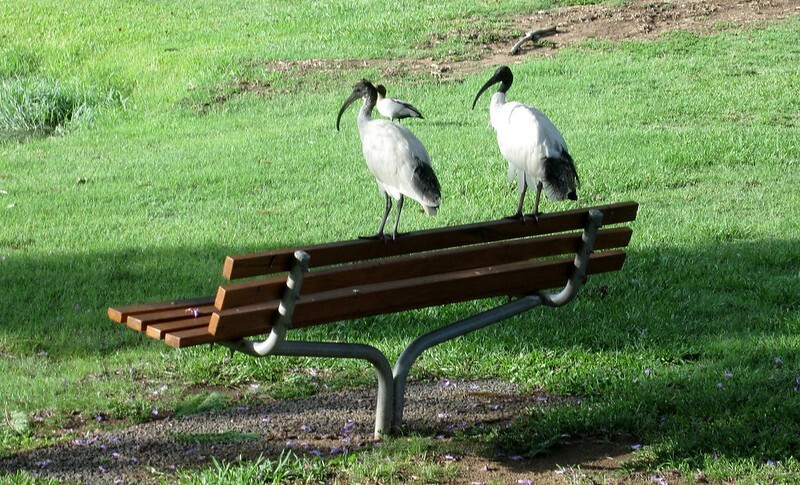 We sat on the bench and chewed the fat for quite a while, watching the swans and other birdlife on and around the lake. Peak hour had rolled around by the time we caught the bus back. I hopped off in the City; my uncle stayed on the bus as it would take him close to home. I wandered around the CBD for a bit, before heading back to the hotel for a cup of tea. 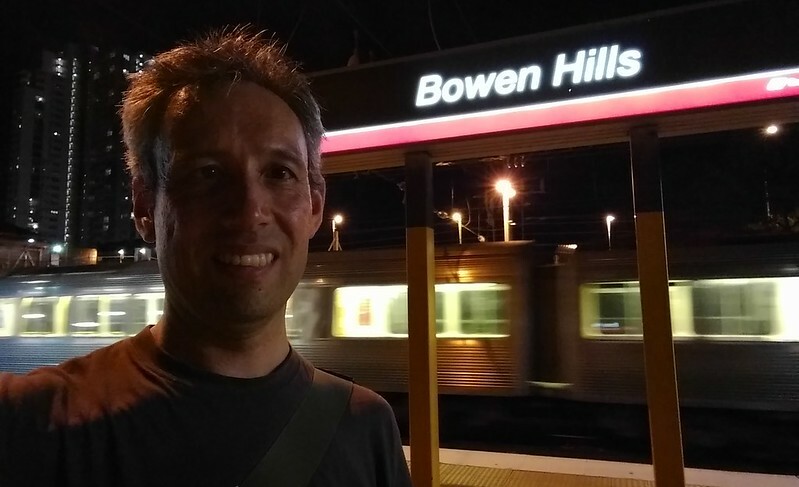 I’d pondered catching up with Robert (from local PTUA-equivalent Rail Back On Track) and/or exploring the new Moreton Bay rail link, but the day was racing away, and instead I went back to Fortitude Valley station and hopped on a train. Back to the hotel, trying not to stare at the dodgy types hanging around at the front of Fortitude Valley station (some of them were now drunk, walking out into the middle of the road to goad the car drivers). A little TV and I started packing. I had an early start to head home in the morning. The plan was to head up to Queensland for a couple of days. For a short break, but also to visit my Dad’s memorial bench at UQ, and see my uncle Frank. I devised a plan to fly into the Gold Coast so that (given nobody else was coming) I could have a look at the Gold Coast Tram Light Rail, which was built after my last visit in 2011. And as a bonus, my sons were flying back from their holiday on Tuesday, so I could meet them at Melbourne Airport on the way home. 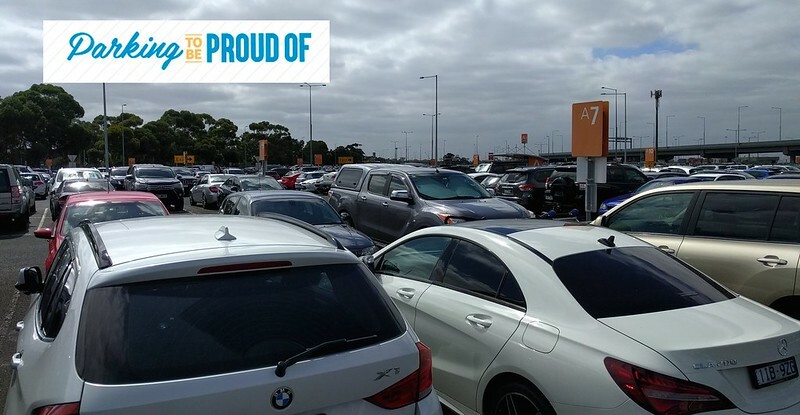 Given the offspring would be flying in all the way from the USA, probably tired, and I’d be going to the airport from Footscray, I thought I’d drive, so booked the long term car park. A couple of days before departure, the Airport web site sent me an email inviting me to upgrade to undercover parking at T4 for an additional $20. Given the weather forecast for the Tuesday was hot, I considered this, and tried clicking the link to see if it gave any more details. It… didn’t work. Okay, never mind then. Come Sunday morning I found myself driving around the long term car park, hunting for a space. Given it’s the cheaper, less convenient option, it was remarkably full. This, according to their slogan, without a hint of irony, is “Parking to be proud of”. Eventually I found a space not too far from the northern end, and rather than wait for the shuttle bus, walked to T3 (Virgin) to check-in. Possibly foolishly I booked in one of my bags – they were both pretty small, but I do like not having to carry too much stuff around the airport. Unlike the car park, the flight wasn’t entirely full; I managed to score three seats to myself. Despite dire warnings (via email and text) of delays around Coolangatta, the flight was on time all the way, though as usual my ears did their thing on the way down. I wasn’t the only one – it seemed like all the babies on the flight were also having a bad time. At Melbourne, some rows had boarded via the pier, others had the option to board via the tarmac. I like to think of it as the rock star option. At Gold Coast Airport, it was all via the tarmac. 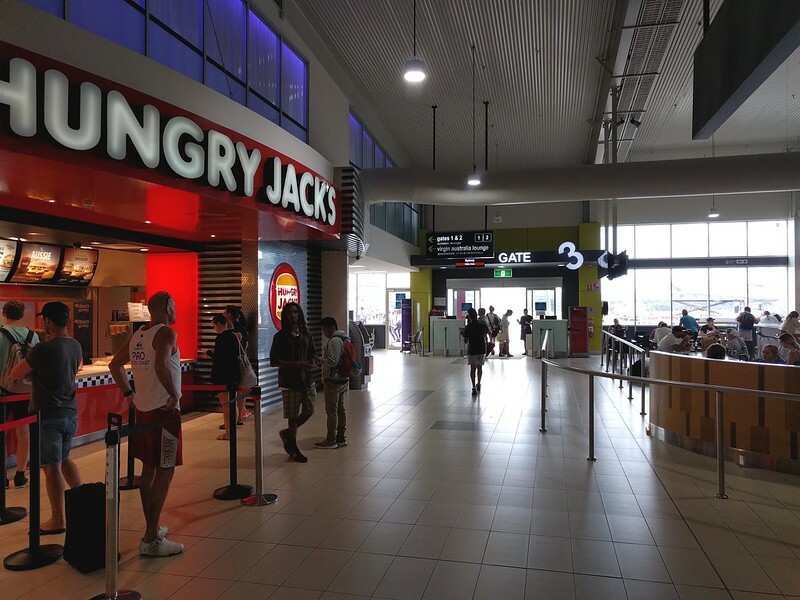 It’s not a big airport – it reminds me of Hobart but busier, and while Melbourne is sometimes called a car park with an airport attached, Gold Coast was more like a food court with an airport attached. I picked up my luggage and headed for the bus stop, which was easy to find — straight out of the terminal, follow the signs, about 50 metres. This is in stark contrast to the PTV bus stop at Melbourne Airport, which is a hike to a bus terminal way down past terminal 4 in the “transport hub”. In fact, Translink have quite obviously put some thought and effort into their airport route overall. It’s a limited stops route running from the airport to the southernmost terminus of the light rail, so if you’re a bewildered tourist, you’ll have no trouble navigating this. No danger of missing your stop. And it runs every 15 minutes every day of the week, until after 11pm. Evidently the 777 gets pretty busy; our bus was pretty big, with special luggage space, with only about ten people aboard. But I saw double-deckers on the same route. 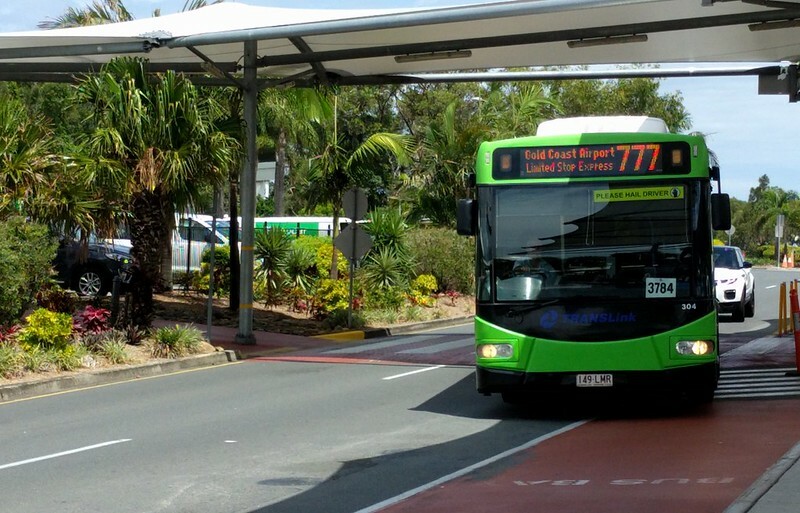 The 777 connects to the new Gold Coast Light Rail, opened in 2014. There had also been warnings of disruptions on the tram. Earlier in the day one tram had been derailed when hit by a fire truck, causing long delays — happily the service had resumed by the time I got there. 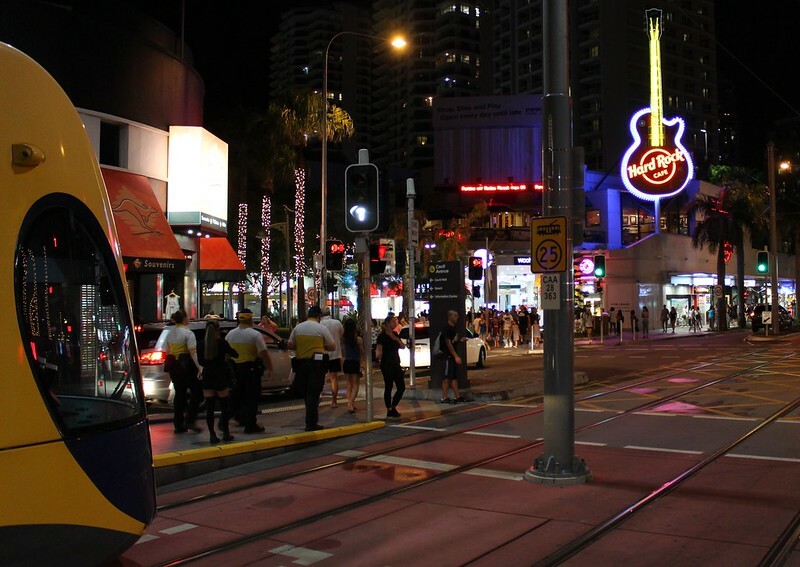 The tram took me to Cavill Avenue in Surfers Paradise, and I went and found my hotel and checked-in. It was a very nice room. Very nice view across the river. Alas, no WiFi! In 2017! If you want in-room Internet, it’s wired, and $10 a day. 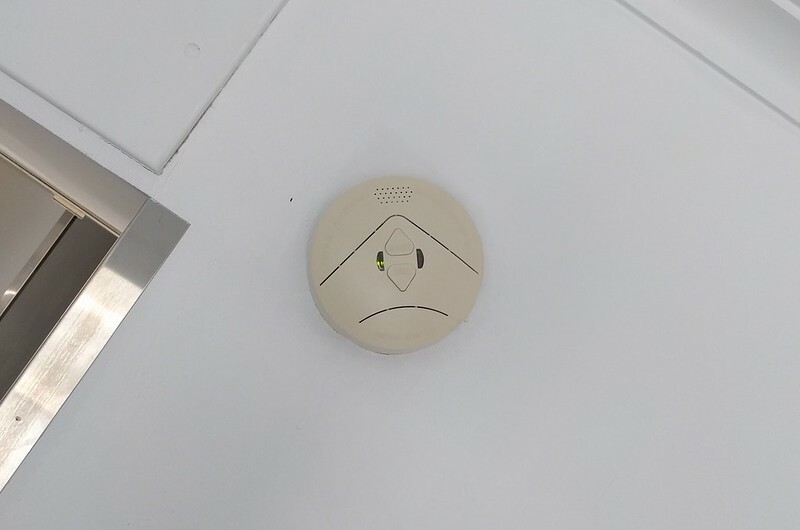 This seemed to make the smoke detector sad. They only have free WiFi in the hotel lobby, which I suppose might be a way of socialising with your fellow guests… if everyone wasn’t so intently staring at their screens. M couldn’t come on this trip, so after settling in, I headed out for some tram joyriding. Seriously, I saw some things this new(ish) system can definitely teach Melbourne. Lots more about this later. 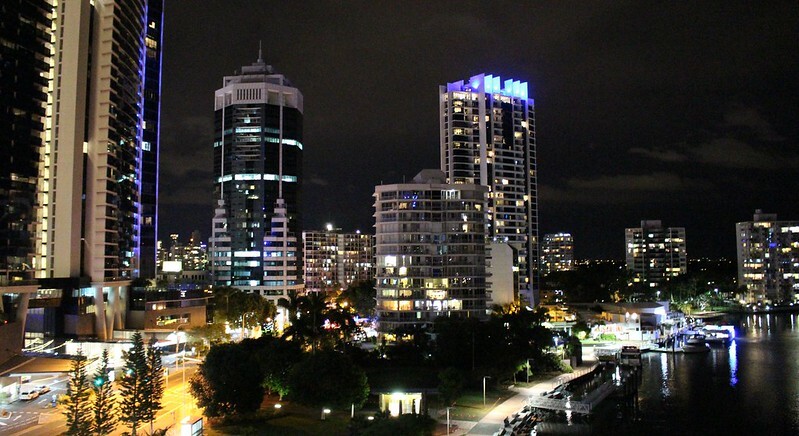 I got back to Surfers Paradise and walked around for a bit. 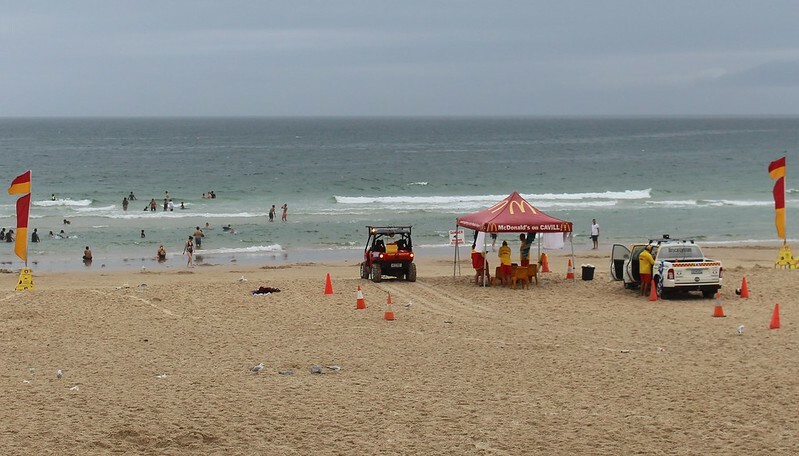 It was drizzly though warm, and most people had vacated the beach. Ducked into an underground Woolworths to get a couple of things. Amazingly busy, as they often are in tourist areas. I noticed there’s also a Coles and another Woolworths in close proximity. The drizzle had given way to full blown rain by this point, though apparently Brisbane had around 80 mm. 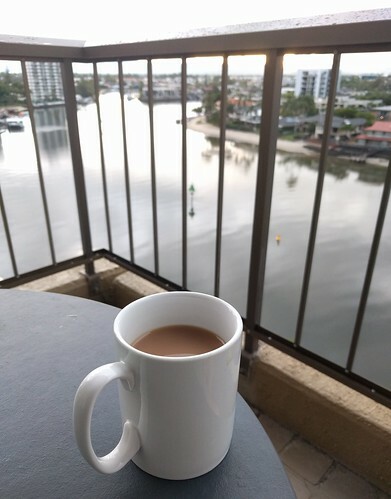 Out with the umbrella and I walked back to the hotel for a cup of tea to watch the sunset and listen to a nearby club with a cover band belting out greatest hits, including a set closer of an extended elaborate version of Paul Kelly’s Dumb Things. The rain stopped and I was hungry. Google reviews indicated a good pasta and pizza restaurant nearby called Salt Meats Cheese, which did me a very quick very tasty prosciutto and rocket pizza. After that a further walk around along the main street, Surfers Paradise Boulevard. It was still pretty busy out. I assume there’s a lot of CCTV – on some traffic light poles I found warning signs that the council is busy filming you. Back to the hotel. I grabbed a complimentary copy of the Courier Mail in reception, and relaxed for a bit and flicked through the paper. Getting ready for bed I spied a cockroach crawling up high on the wall. Eugh. Sigh. Oh well, I whacked it with the complimentary newspaper and it dropped off the wall dead, fortuitously straight into the rubbish bin below. No big deal, but the usual thing with the creepy crawlies is that if there’s one, there’s probably more lurking. I mentioned it the next morning when checking-out. 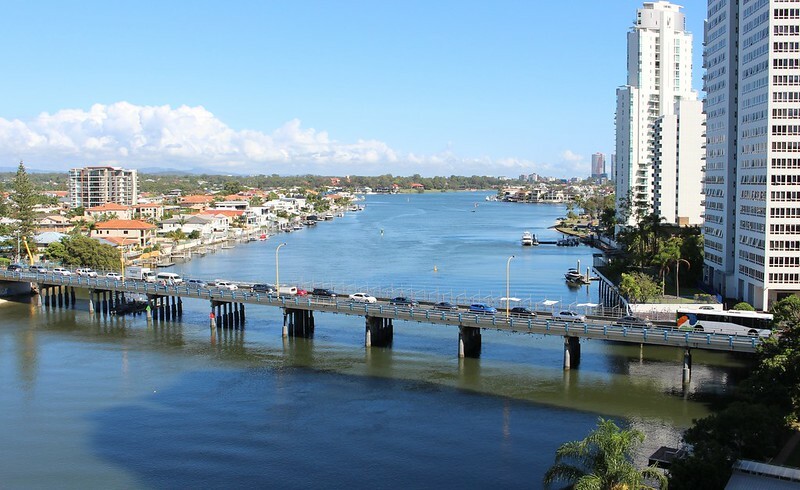 To finish this post, here’s the view along the Nerang River — as spectacular as night as it is during the day.